Today was an absolutely gorgeous day here. It was bright, sunny and in the upper 70s. The pollen has really started in full force though -- there is a green haze on our cars already. I awoke bright and early this morning at 6:00 a.m. for some reason and couldn't fall back asleep. I finally got up around 7:00 and put a turkey breast in the crock pot to cook for dinner. I cooked it on high for the first 3 hours and then turned it down to low for the next 6 or 7 hours. 4) Cook on high for first 3 hours; Turn to low and cook an additional 6 to 7 hours. Hubby and I took our walk before breakfast and got that out of the way early -- we intended to go for 30 minutes and ended up walking for 45 minutes since it was so gorgeous out. Putting the turkey breast in the crock pot was nice because I was able to work on some projects around the house, get my grocery shopping done as well as some other shopping and have dinner already started for me when I got home. Youngest son came by and had dinner with us and it was nice not rushing around at the last minute. 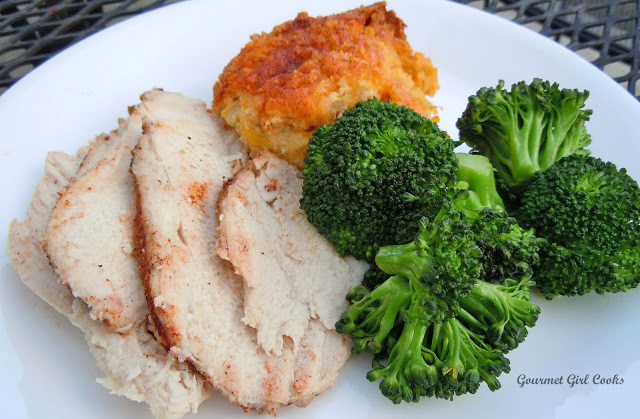 I had plenty of the Yellow Cheddar Squash Casserole left from last night to go with our Crock Pot Roasted Turkey Breast and just steamed some fresh broccoli to go with it and "Boom"...dinner was ready in no time! I snapped a photo below for you to see. Enjoy! This recipe is definitely going on my "short list." Hi Cybersis! I hope you enjoy it. I actually ordered some myself today. The last time I bought it I got it on sale at 15% off, so even though I don't need it quite yet, I decided to get another bag at 20% off. New to Gourmet Girl and loving it! Was your turkey breast boneless? Thanks for the flour info and everything else!